Bulk plastic custom imprinted Business Cards at the lowest price in the USA and Canada. The plastic business cards are vastly superior to regular Business Cards, made of paper or laminated paper . They are a lot more durable : they last forever without any degradation and are not damaged by bending. Also, they can be imprinted on both sides and the back imprint is absolutely free. Some people prefer to add the calendar on the backside, but you may add anything you want, including logos and graphics. Accordingly, you can add a lot more info about yourself, your services or your products on our plastic business cards. The plastic business cards may also be used as membership cards, due to their durability and exquisite aspect. You may use an unlimited number of colors or a photo on both sides of the Plastic Business Cards. 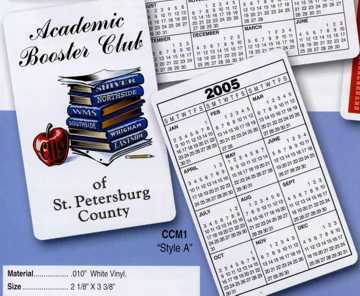 Unit priced below include your full color custom imprint in front and on the back. Free artwork design. We will send you a proof for your approval before production. American clients pay no taxes. Setup: $29.00 per order; No Setup Charge on repeat orders. Copy or design changes in multiples of 500: add $25.00 each. Pre-Production Sample in True Colors: $60.00 (paper proof is free). Estimated Production: 10-12 days after art approval; Contact us for faster delivery. Material: 0.010 or 0.015 white gloss vinyl.